Welcome to the Datsun 320 Resource! The Datsun 320 series of pickups were built from 1961 through 1965 and include two variations, the L320 and the NL320. 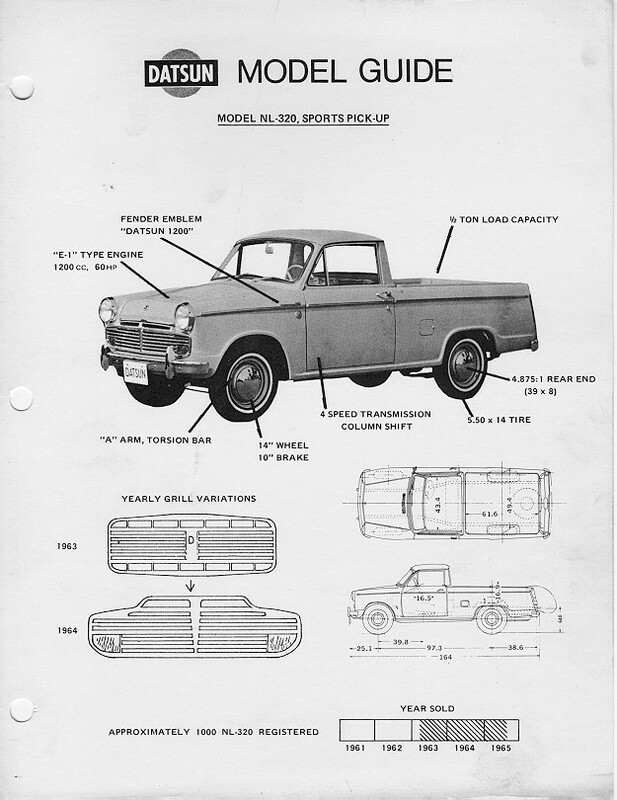 Powered by a 60-hp E1 engine, with 1189cc of displacement, the Datsun 320 pickup was capable of a half-ton payload. The 320 series was preceded by the 1959 Datsun 222 Pickup and the 1960-1961 Datsun 223 Pickups. The Datsun 320 pickup trucks retained their A-arm torsion bar front suspension, and leaf spring rear suspension. Rear end ratio was a low 4.875:1. This low gearing, coupled with a 4 speed transmission, kept comfortable cruising speeds at or around 60mph. Fender emblems on the 320 showed "Datsun 1200" in a horizontal type script and round "60 HP" emblems below, on each fender. A round "Datsun" emblem was present on the nose of the hood. The 320 came in two cab and bed versions. The NL320 was built in 1963 to 1965 and was substantially more rare, with approximately 1000 produced. The NL320 featured unibody construction, which meant the cab and bed are one piece, and the doors are approximately 2 inches longer. Its back half was, of course, greatly different than the standard model L320 pickup, with its traditional pickup bolt-on bed. All Datsun 320 pickups came equipped with a 4 speed manual transmission, and the majority had the shifter on the column. However, the next generation pickups (the 1966 520's) came with a floor mounted shifter. As a result, the floor mounted 4 speed also made it into some of the late model 65's. Several earlier 320's were converted to floor-mount shifters as well, either because of a transmission replacement somewhere along the line, or an engine swap (or just for convenience). The Datsun 320 is powered by a 1200cc "E1" engine with 60 horsepower. A positive ground electrical system with generator was used. Identification of the correct year of your 320 is best accomplished by looking at the front end. 1962: The 1962 320 had a pressed steel grille with a thin vertical bar in the center. Round turn signals appear under the headlights. 1963: The 1963 320 had a pressed steel grille with a wider vertical bar in the center, with a 'D' pressed into the wide vertical bar. Round turn signals appear under the headlights. 1964: The 1964 320 had a wider pressed steel grille that extends across under the headlights and encloses the front turn signals. The turn signals are a rectangular shape with one corner rounded off. 1965: The 1965 320 was only in production until April 1965, until it was replaced by the 520 model. As such, the 1965 model is fairly uncommon. It has a wide pressed steel grille that extends across under the headlights and encloses the front turn signals. Signals are a round shape, the same as the earlier 1962-1963 models, and are thought to be leftover from earlier production. Mark 1 E-1 engines from 000001 to 152699 have offset connecting rods with bearings are 1 inch wide. Uses a bypass type lubrication system. Mark 2 E-1 engines from 152700 to 280169 use a bypass type lubrication system, oil filter housing is cast into the engine block. Camshaft oil pump/distributor drive cog has 10 teeth. Mark 3 E-1 engines from 280170 to 547143 use a full-flow type lubrication system with a detachable alloy oil filter housing. Camshaft oil pump/distributor drive cog has 13 teeth. Mark 4 E-1 engines from 547144 onwards have the oil pressure relief valve located on the oil filter housing.